G. A. Webster, Freeport, Illinois, circa 1880. The Cabinet Card has the appearance of a larger version of the carte de visite, retaining the photographer's imprint and exhibiting similar styles of decorative artwork on the card face or back. Like the carte de visite, it consists of a paper photographic print mounted on commercially produced card stock of standard size. Despite the similarity, the cabinet format was used for landscape and vernacular views before it was adopted for portraiture and likely borrowed influences from both the "card photograph" (carte de visite) and stereographic views of the period. Styles of portraiture generally copy those of the carte de visite but take advantage of the larger image area. The majority of cabinet cards were albumen prints, but toward the end of the nineteenth-century other types of photographic paper began to replace albumen papers. The albumen images are yellow-brown or purple-blue in tone, a result of the common practice of gold toning ("sepia" tone includes the effects of yellowing and albumen fading in addition to the original tone). You may see cabinet card images from 1890s that have the appearance of a black and white photograph. These photographs exhibit what is called by photographic experts a neutral image tone and were likely produced on a matte collodion, gelatin or gelatin bromide paper. Sometimes images from this period can be identified by a greenish cast. Gelatin papers were introduced in the 1870s and started gaining acceptance in the 1880s and 1890s as the gelatin bromide papers became popular. Matte collodion was used in the same period. If you have a black and white image on cabinet card, it is likely to have been produced in the 1890s or after 1900. The last cabinet cards were produced in the twenties, perhaps as late as 1924. The cabinet card steadily increased in popularity during the second half of the 1860s (after the Civil War in the United States, starting in 1866) and into the 1870s, replacing the carte de visite as the most popular form of portraiture. This was because it offered a larger image. The cabinet image was large enough to be viewed easily from across the room or displayed on a side table. The Cabinet Card on its wooden stand joined the photograph album as a fixture of the Victorian parlor. The print offered enough area to to show the face in great detail. The introduction of the cabinet card was responsible for the temporary demise of the photograph album (which came into existence commercially with the carte de visite) and hastened the introduction of retouching. Photographers began hiring artists to alter photographs (by touching up the negative before making the print) to hide facial defects revealed by the new format. Small stands and photograph frames for the table top replaced the heavy photograph album. Manufacturers did respond by producing albums with pages primarily for cabinet cards (with a few pages in the back reserved for old family cartes de visite) but the photograph album did not see a revival until the scrapbook era. The introduction of gelatin papers (Gelatin prints were heavy enough they did not require a mount to prevent curling as did they extremely thin albumen prints common to most card photographs.) and increasing ranks of amateur photographers meant declining demand for cabinet cards towards the end of the nineteenth century. For nearly three decades after 1860 commercial portraiture was dominated by the carte de visite and cabinet card formats. In the decade before 1900 the number and variety of card photograph styles expanded in response to declining sales. Manufactures of standardized card stock and print materials hoped to stimulate sales and retain public interest in card photographs. However, the public was increasingly demanding outdoor photographs, enlarged prints they could frame and even began making their own photographs. Most of these new photographs were not designed to be mounted. The cabinet photograph accompanying this article is an 1870s-1880s cabinet card showing all the elements common to a card photograph: a gilt decorative border, a print mounted on a Bristol board or colored cardboard card, and an imprint giving the photographer's name and location. This picture has a blue tint to the non-image area surrounding the grayish-brown image area. Tinted albumen papers gained popularity in the 1880s, offering subtle pink and blue coloration to the non-image areas of the picture. The brownish gray vignette and blue paper make an unusual combination in this image. The dimensions of the standard Cabinet Card are 6 ½ x 4 ½ inches or in metric measurements 16.5 x 11.4 cm. Card stock is thicker than the carte de visite with earlier cards being made of Bristol Board gradually giving way to various types of press board (early cardboard) or cardboard (paper made from pressed layers of paper like a sandwich) cards throughout the 1880's and 1890s as technology for manufacturing cardboard advanced. Cards showing evidence of separating layers on the edges are definitely made after the introduction of pressboard and cardboard technology (after 1870) replacing the Bristol Board (a single layer card stock) of the 1860s. Introduced. In 1866, the Cabinet format was adapted for portraits. The format had already been in use for some years for views. Peak. Although not uncommon in the 1870s, the cabinet card, however, did not displace the carte de visite completely until the 1880s. Waned. The 1890s witnessed the decline of the cabinet card and the card photograph album, replaced by the snapshot (an unmounted paper print) and the scrapbook album. 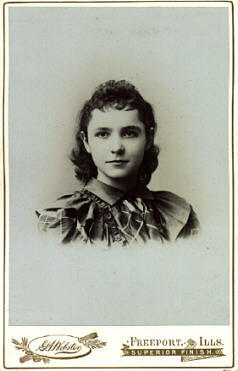 A variety of other large card styles of various names and dimensions came about for professional portraits in the 1880s and 1890s. After 1900, card photographs generally had a much larger area surrounding the print. An embossed frame around the image, heavy, gray card stock and blind imprints were hallmarks. Last Used. The cabinet card was popular and continued to be produced until the early 1900s and quite a bit longer in Europe. The last cabinet cards were produced in the twenties, perhaps as late as 1924. Collector's Guide to Early Photographs by O. Henry Mace. Cartes de Visite in Nineteenth Century Photography.by W. C. Darrah. Copyright © 1995-2005 City Gallery. All rights reserved. Photographs may not be reproduced without permission.